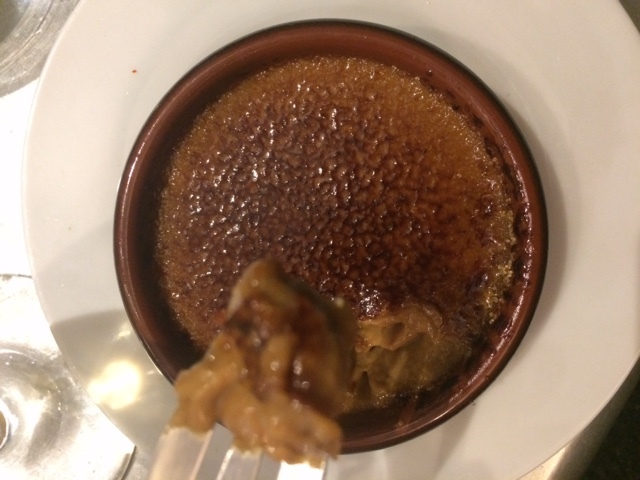 My first time at the French tapas spot, L'Avant Comptoir, was a few years ago after watching an episode of one of Anthony Bourdain's many travel shows that took place n Paris. I wasn't thrilled with the place because is was standing room only, crowded, and I ordered the wrong menu items. I thought the savory macaron would be a good idea but when it arrived I found out it was blood sausage and let's face it, my palate is just not there yet. 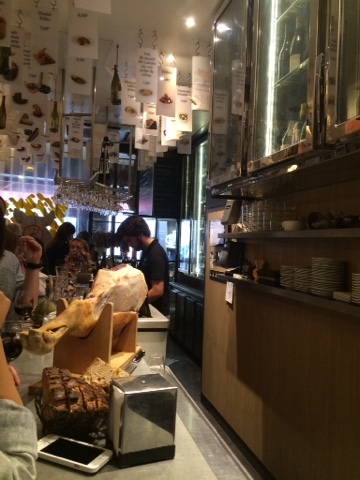 Well, this time around I was traveling solo and walked by L'Avant Comptoir before the after work crowds arrived. I went it and claimed my spot at the far end of the bar against the wall so I could lean and watch all the action as I stand in my corner. The server was very accommodating, as he spoke English for me and asked what kind of wine I like (Strong? Sweet? Red or white? Strong red, yes.). 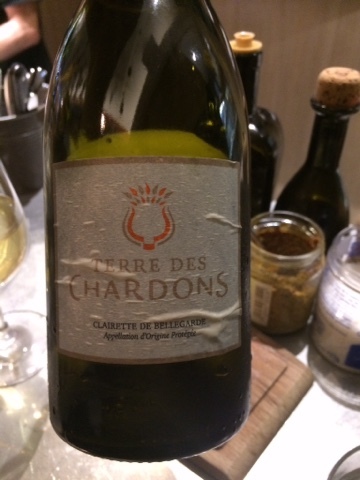 He picked out a wine for me that was delicious, and I wondered if the taste reflects the price, however I found later that the wine was only €5. My kind of place. 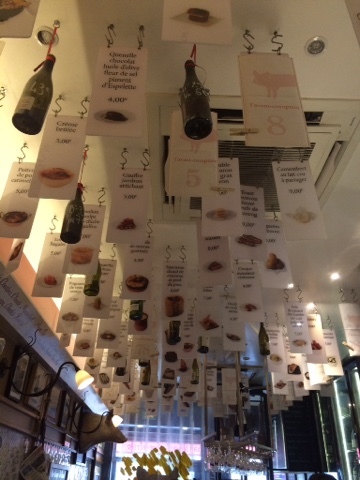 The laminated cards hanging from the ceiling were the menu items displayed by a photo, description in French, and price. 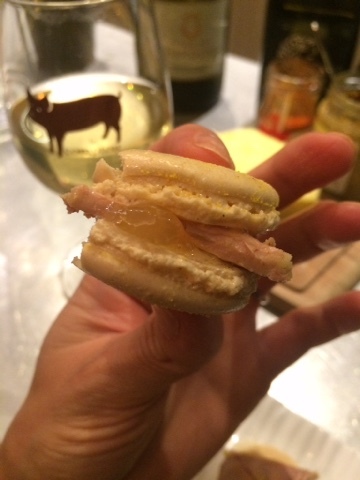 I saw the savory macaron was with foie gras with citron and I ordered it. 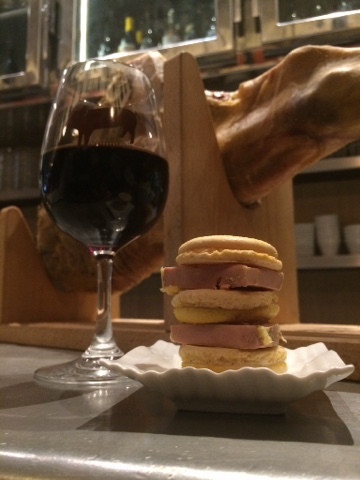 It arrived as a double decker macaron, generously stuffed with foie gras. This was the highlight of my trip to Paris. I ordered a second serving (€5 each and worth every cent). 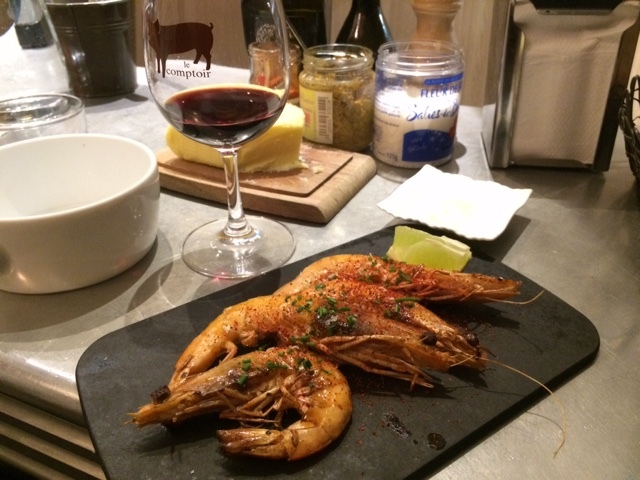 I then switched to a nice white wine and ordered the spicy prawns and a coffee crime brûlée for dessert. 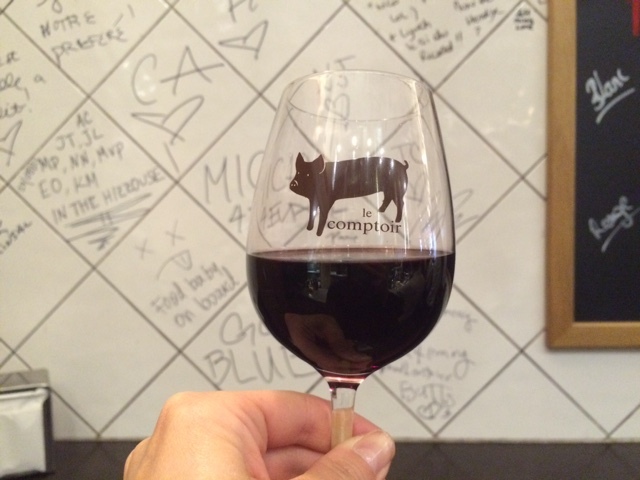 I have to say, I will continue to come to L'Avant Comptoir. This was an experience that went above and beyond my expectations. I stayed for about an hour and I forgot I was even standing the whole time (or leaning). This is a great spot for solo travelers like myself or for couples looking to try multiple dishes and wines without shelling out a crazy amount of cash. If this place existed in NYC prices would be through the roof!!!!! Santé, L'Avant Comotoir!!! Merci! 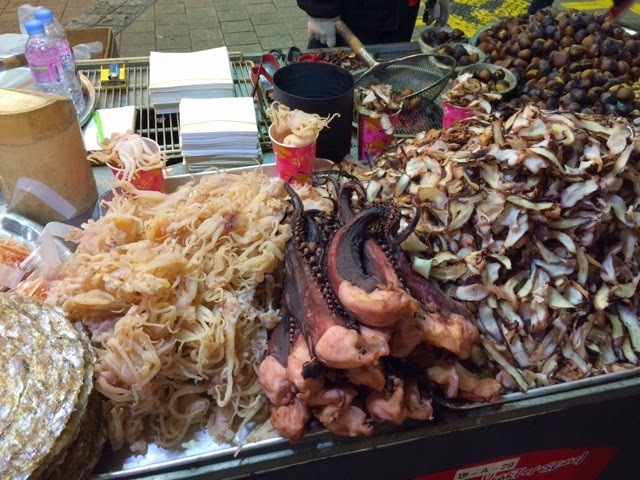 I've come a long way since my gag-worthy experience eating a generous portion of raw squid in one bite at the famous Tsukiji Fish Market sushi shop, Sushi Dai. It was just three years ago but I've grown an appreciation for sushi and now I'm eating the food that began as Japanese street food several times a week! 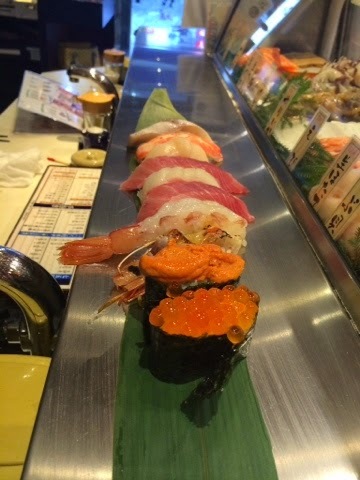 My recent trip to Tokyo quickly became a sushi tour. 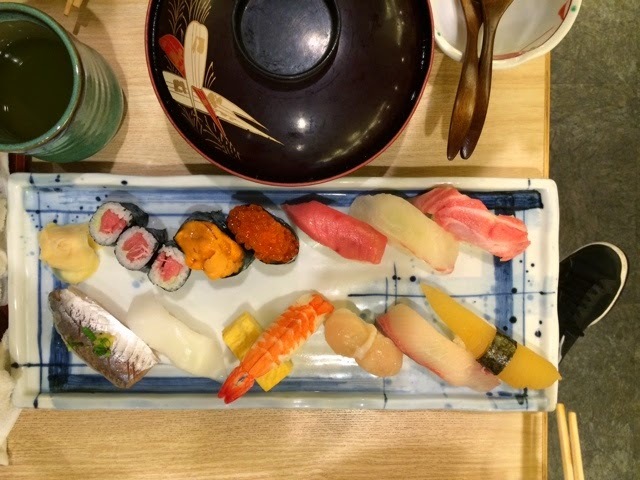 We ate sushi at all price ranges and styles including omakase, stand-up, conveyor belt, etc. We took the train from Shinjuku to Tsukiji before the sun came up one morning. 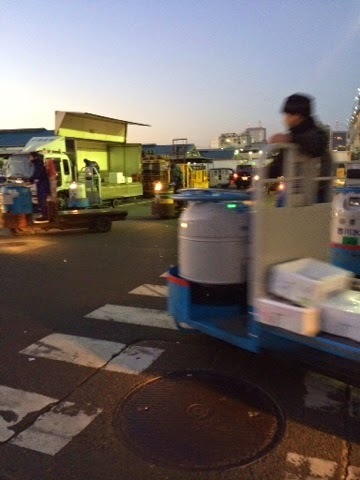 We dodged motorized carts that came at us from every angle as we made our way through the fish market. I can't believe tourists are even allowed in there. It's fast paced and dangerous in an exciting way. We ate at Sushi Bun after much research prior to this trip. 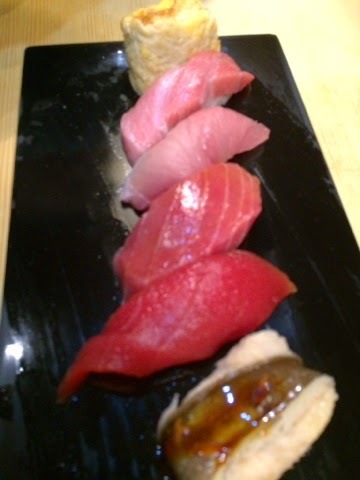 It was similar to the high quality of Sushi Dai and Daiwa without the three hour long wait. We got in at 7am after waiting just 15 minutes. No photos were allowed but I snuck a few shots of the perfect omakase they made us. The quality was the best I've ever had and the eel was especially outstanding! It was sweet and soft, almost like mousse. It's their specialty. 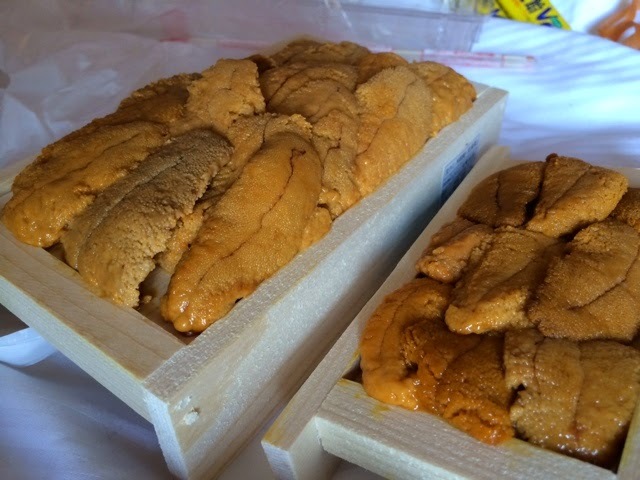 The cost of this omakase was approximately $35 each. Shibuya has some kooky shops and restaurants. We wound up eating at two different sushi joints. 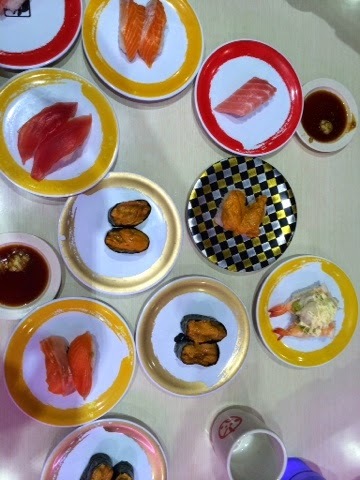 We went to a conveyor belt sushi spot called Genki. We ordered off an iPad and plates zipped around to the table. 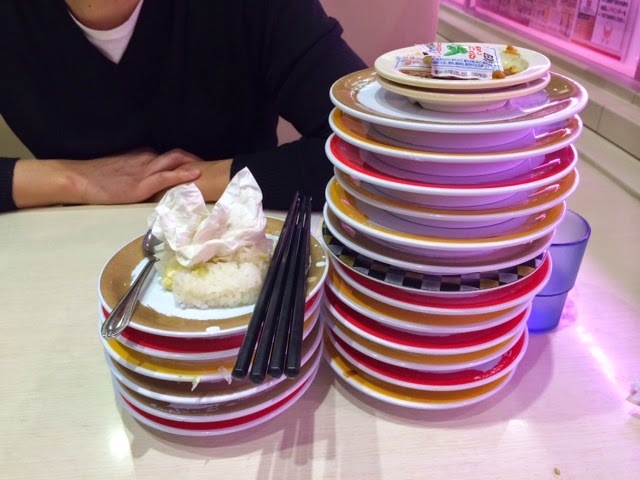 We had 19 plates of sushi and we spent less than $30. 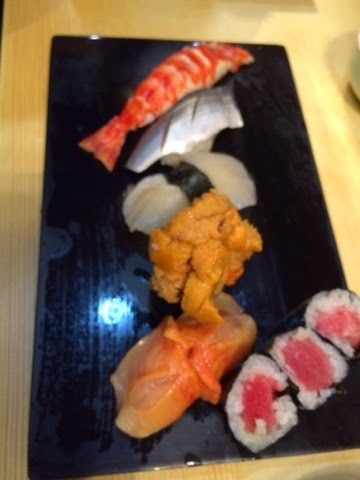 The quality wasn't on par with the Tsukiji omakase but it was still pretty good. 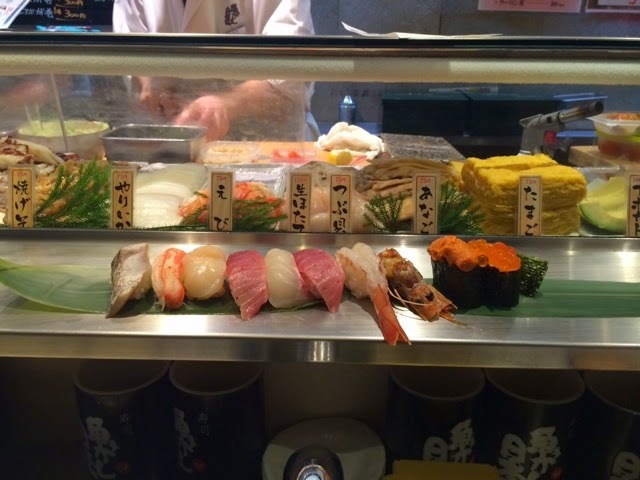 The next Shibuya sushi spot was Uogashi Nihon-Ichi for a stand up meal. The sushi bar was set up without a single chair. It's meant to be a quick meal spot. The quality of fish here was pretty high but you wouldn't think so from the price. A 10-piece omakase set was only $15. We ate and ran. 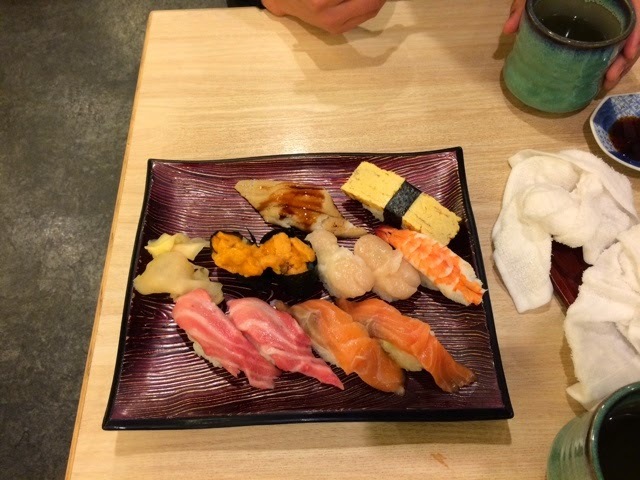 The day we left Tokyo we woke up early craving sushi. We found a 24-hour spot in a Shinjuku called Kizuna. The toro was great, so was everything else. 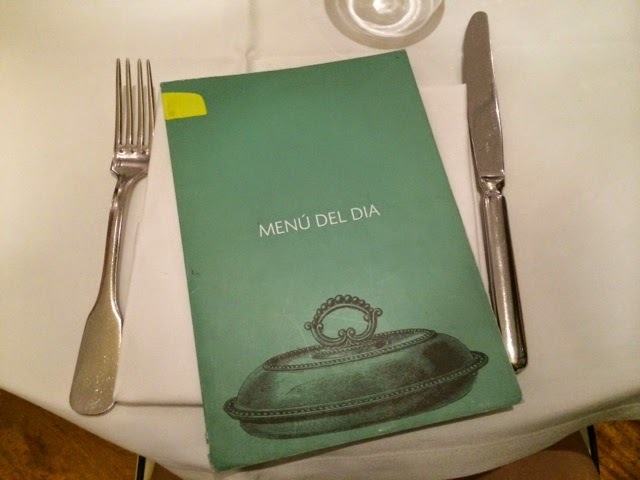 It was reasonably priced and perfect for the jet-lagged traveler with 24-hour cravings. Sushi is my favorite food these days, and I partially blame the documentary 'Jiro Dreams of Sushi' for this. Although we didn't get to visit Jiro's restaurant, his apprentice opened a sushi spot in New York City. Chef Nakazawa opened Sushi Nakazawa in the West Village and we had the chance to eat there last week. I'll post all about the incredible experience shortly! 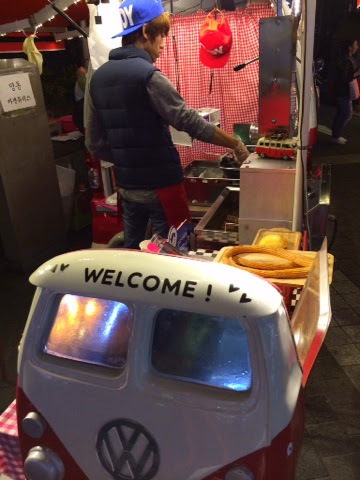 Churros. Or at least that's what it looked like to me. It's fried in tube form or stuffed with ice cream (i.e. Fried ice cream). This one I didn't try because I knew the road ahead was much tastier than that and I had a savory snack in mind first. 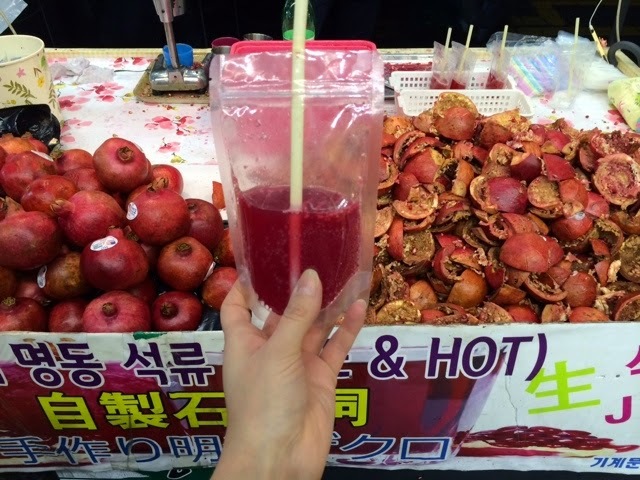 Okay, I said I wanted something savory but I couldn't pass up the fresh pomegranate juice. It was mixed with ginger ale to cut the tang I assume. It was sweet and tangy with a little fizz. Delicious. I basically came to Seoul for this. 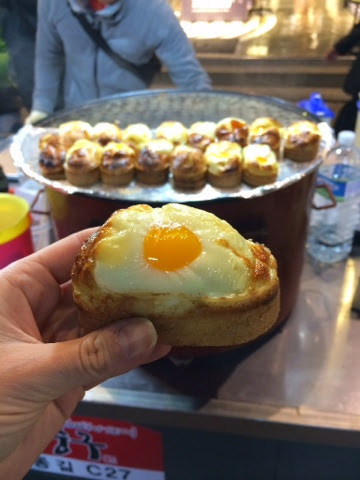 The egg toast. 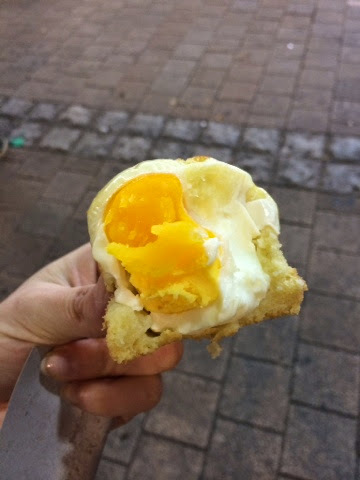 Baked right there in that street oven, it's an egg baked in some kind of sweet bread. It tasted like cornbread to me. It was piping-hot, sweet-and-savory heaven. If I could change anything it would be for the yolk to be runny. This corn. It's magical corn. 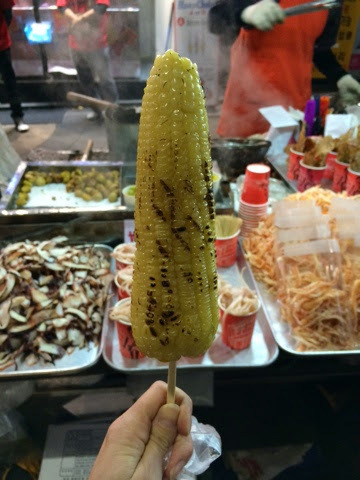 I don't know what the Koreans are doing but this corn looks straight out of a cartoon. It's the Giselle of corn. Not only does it look good but it has a great personality. 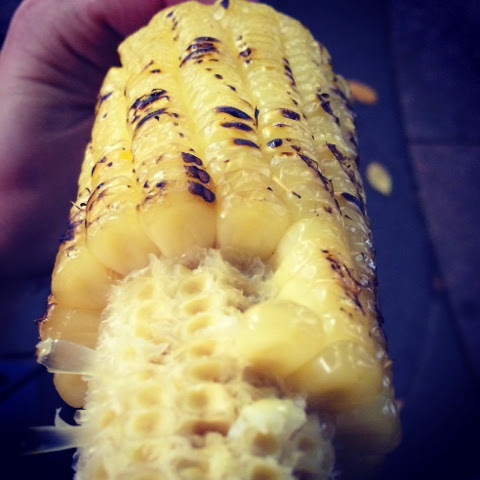 With each kernel seemingly on steroids, the taste is suspiciously buttery and sweet without the slick butter residue on your lips and face afterwards. Because there IS NO BUTTER! This is the natural flavor. And guess what else? Each kernel pops out without a fight, leaving nothing stuck between your teeth. No floss required here. Again, magical corn. "I'll have the octopus tentacles with a side of chestnuts!" Said no one ever. They are big on fish chips and octopus jerky here. Maybe chestnuts are in season. Maybe it goes well together. Or maybe it lures in the round-eyed tourists like myself? Regardless, I passed this time. I never leave without dessert. This ice cream cone is stuffed from both ends with dark rich chocolate and creamy vanilla. I realize I look like a complete idiot in the street eating drippy ice cream from both ends of this suspicious tube, but for me it was symbolic. 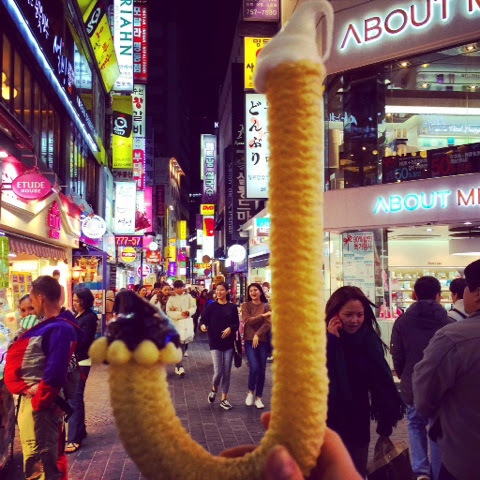 "J" for Jack Of All Travels. "J" for jeans are tight. "J" for one jacked up looking ice cream cone. 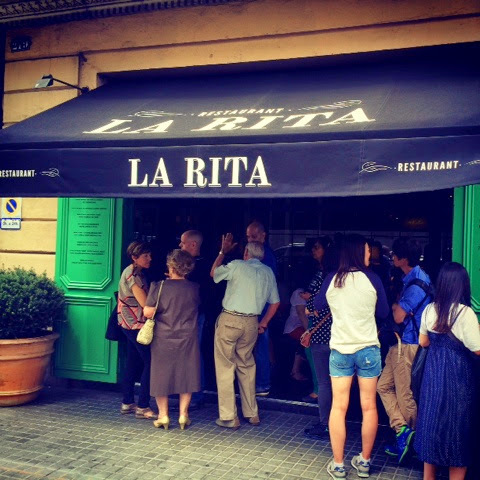 I find this restaurant in Barcelona, La Rita, to be the perfect lunch spot for the frugal traveler. The value of this 3-course meal (with wine!) is much more than the price they are charging. Choose an appetizer, entree, and dessert off the pre-fixe menu of the day and it'll cost you €10 after tax is added. This includes a generous size glass of wine. The lunch menu changes daily, and they only stay open from 1pm-3:45pm, so that explains the long line that was out the door for the entirety of the meal. 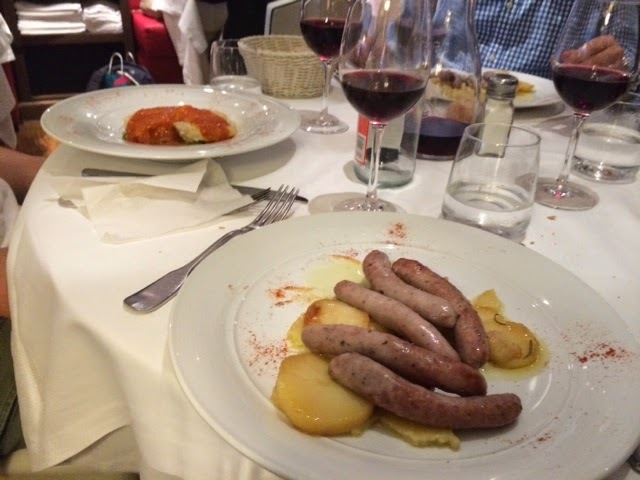 So the food wasn't exactly what I would imagine Spanish food to be famous for, but it was delicious nonetheless. The appetizers consisted of squid ink noodles with garlic sauce, a chilled creamy leek soup, a lentil salad, and a meat sauce cannelloni dish. 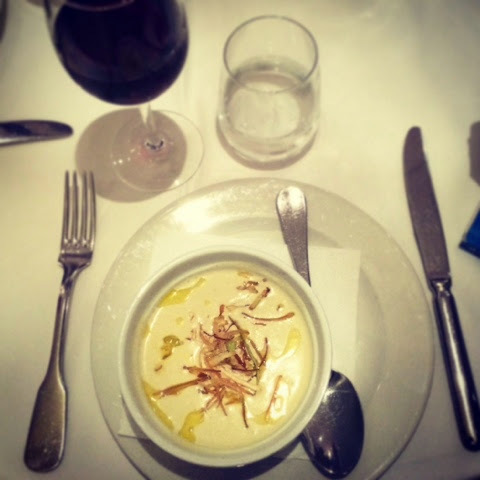 We each ordered a different appetizer but I enjoyed my leek soup the most. It was a nice summery dish with crispy leeks on top. The entree I chose was more German than Spanish but it was so rich and comforting. Sausage with rosemary potatoes. Other options included cod and chicken with eggplant. The dessert was he real highlight. I passed on the fruit salad and baked apple. The Mini Timbaon was calling for me. 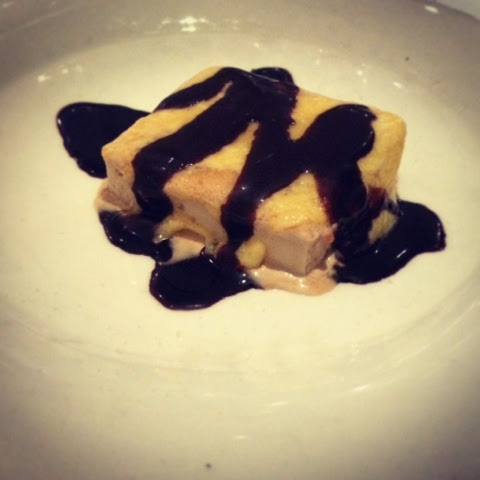 It was nougat ice cream with chocolate sauce and Catalan creme brûlée. The top layer was crispy and the inside was perfection. What added to the enjoyment of the meal was not only the fact that it was inexpensive, but they didn't charge for sparkling water for the table, or even a bread basket! The tablecloths were linen and it was an elegant atmosphere to get acquainted with the city of Barcelona. Me and my 'big city' mentality. How typical of me to believe there is nothing worthwhile down in North Carolina. That is just straight IGN'ANT! Asheville kind of swept me off my feet. 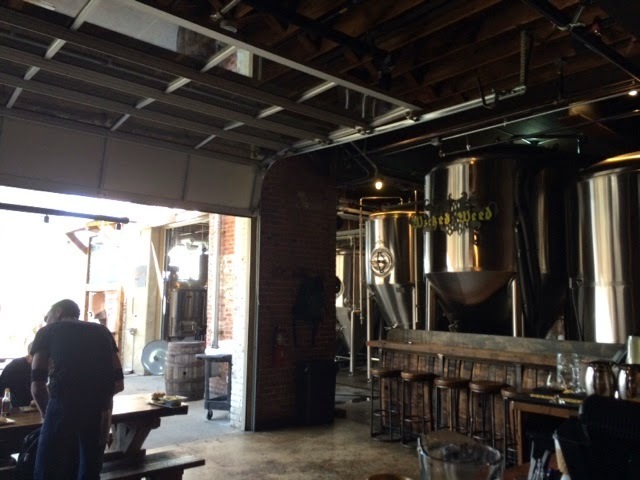 My visit to beer town USA was too short but very sweet. It was a perfect spring day, and I walked through the streets of Asheville feeling all kinds of hippie vibes. I got butterflies in my stomach as I passed a microbrewery on every. single. block. This really was a city of craft beer, I just wish I could stay long enough to try them all. 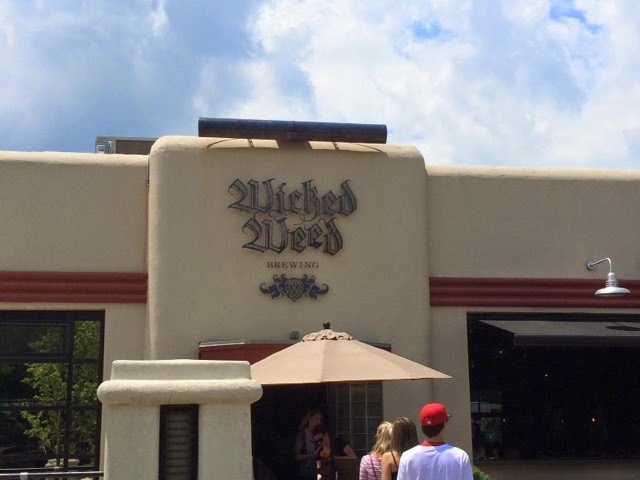 I went in for lunch at Wicked Weed. The place was already crowded and it wasn't even noon. I tried a glass of their Imperial Coolcumber beer (9% ABV). It was served in a glorious goblet with a cute cucumber garnish. 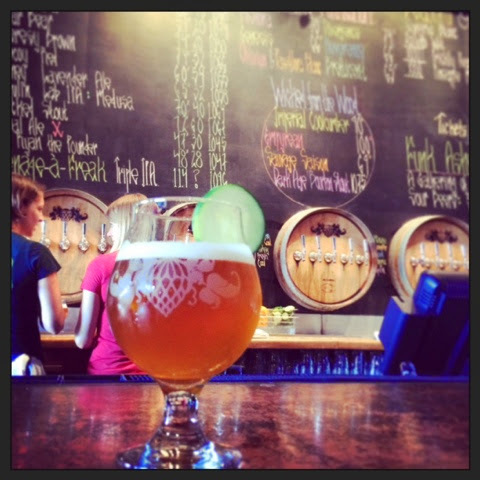 This particular beer spent 3 months in Cardinal Gin barrels and is infused with cucumber and basil. 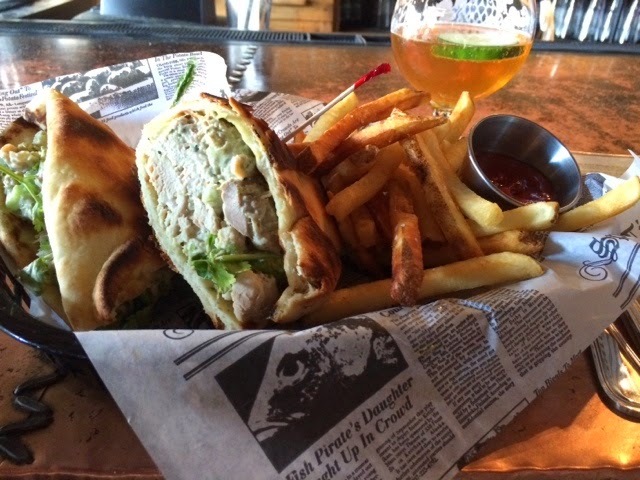 During lunch, where I had a delicious green curry chicken wrap on naan bread, I sampled many beers. One gluten free, one from Cabernet Savignon barrels, and others were strong and fruity. 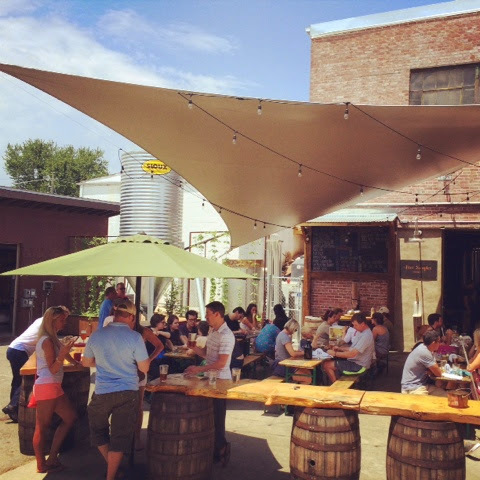 The variety at Wicked Weed is unreal, and it'll be revisited again soon. 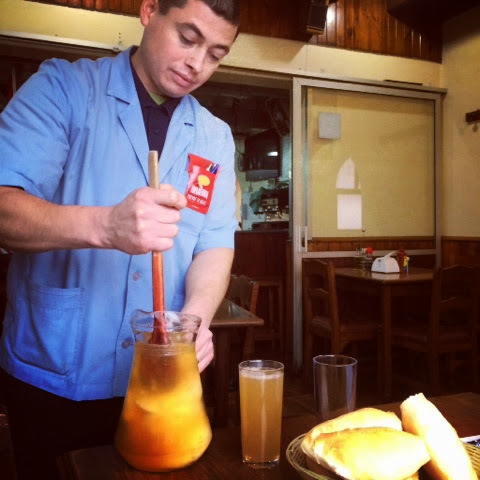 The 'lomito' is a right of passage in Chilean culture. 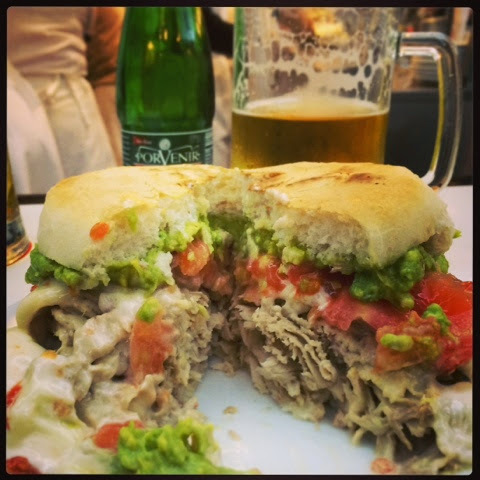 I'm told you haven't tasted Chile until you've had the lomito. 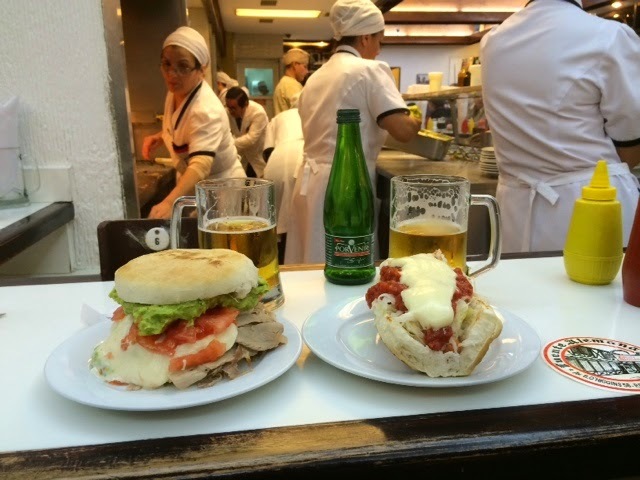 After referring to my favorite travel book, Where Chefs Eat, and crosschecking numerous Anthony Bourdain show clips with locals opinions, I came to the conclusion that Fuente Alemana was the place to go to eat the famous sandwich. Everything is made in a big open kitchen before your eyes by women dressed in old school diner-waitress attire. My waitress wasn't keen on communicating with me. It was clear that she didn't speak English and I did, yet my simple sentences in basic Spanish left her puzzled ("Uno lomito, por favor?"). It's clearly a fast paced atmosphere so fast ordering with zero questions will afford you a friendlier experience. Luckily, I had a third party communicator to help. Orlando, a native Chilean, offered to help translate. He was very helpful and informative while explaining the menu. 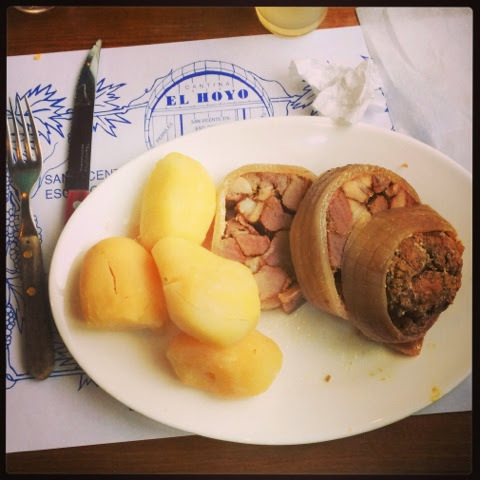 I did enough research to know that I want to eat at El Hoyo, a name that means 'the hole' as in, a hole in the wall. First off, Anthony Bourdain went there so that alone has me interested, I won't lie. I wanted traditional food and an authentic dining experience. We walked 3.5 miles from the hotel to El Hoyo. From what I heard about the food, I knew that walking there would eliminate some of the guilt of eating the monstrous portions we were about to indulge in. Santiago is the safest city in South America so walking was an enjoyable experience. Except when we hit the halfway mark and I started to wish we were there already. So lazy. 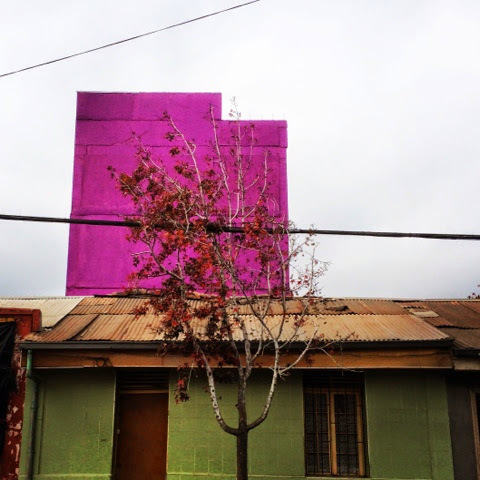 We arrived on San Vicente, a quirky residential street with multiple pastel colored houses and a bright purple building sticking out in the neighborhood sky. 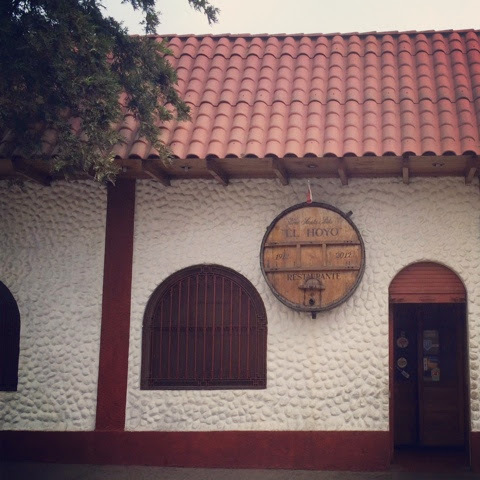 Down the street was a cute cantina, more quaint than I expected, with wine barrels decorating the facade. We sat inside, and were served by Anthony Bourdains waiter. Good start already! 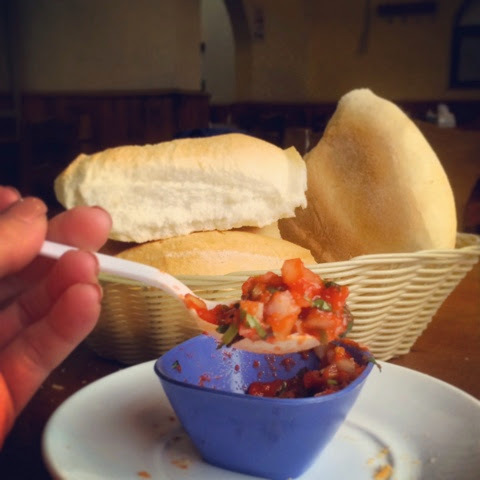 The bread basket arrived, it was crunchy and delicious with the super spicy salsa. 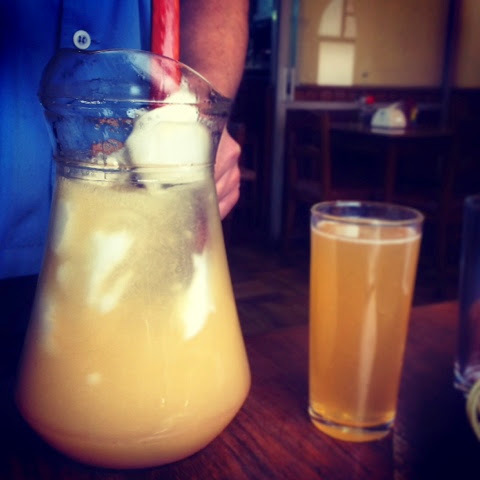 We ordered a pitcher of Terremoto, it means earthquake and it's a mixture of wine called pipeño mixed with pineapple sorbet. Our waiter mixed it table side until it was frothy. It tasted sweet but it packed a punch, as I slowly noticed my cheeks getting hot from the alcohol. We ordered the arrollado and the pernil. 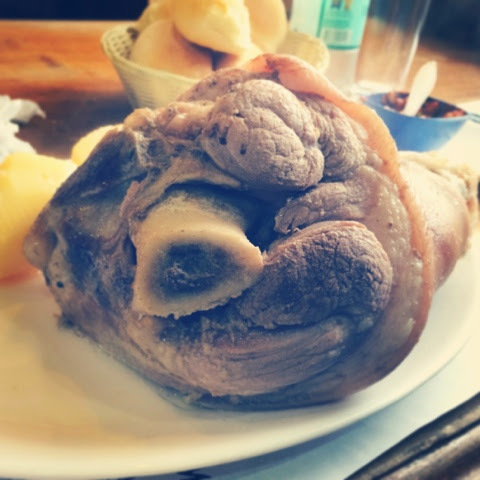 The arrollado is a unique dish made from marinated beef bits rolled up in pork skin, then cooked in a loaf and sliced. Honestly, I was disappointed when I saw it because I thought it looked like mystery meat bits in a lard roll with boiled potatoes. I also heard that Chilean food can be bland so I wasn't sure what the taste would do for me. I was blown away by how flavorful and tender the meat was. 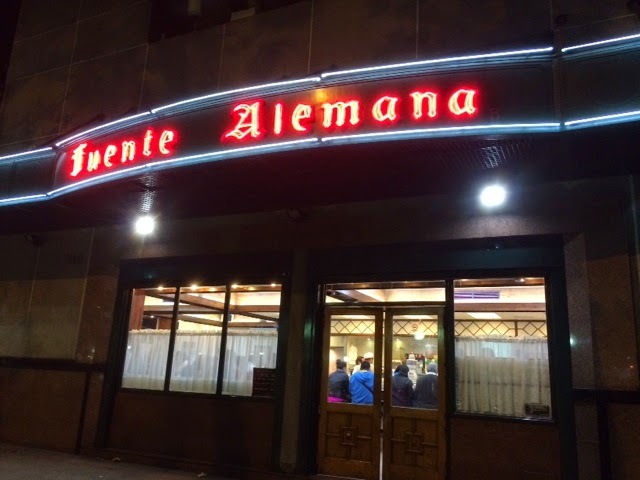 Best meal in Santiago hands down. Aside from the skin and the bits of fat, it was incredible! The locals ate the fat and skin but I wasn't ready for that. The pernil is pork shoulder. 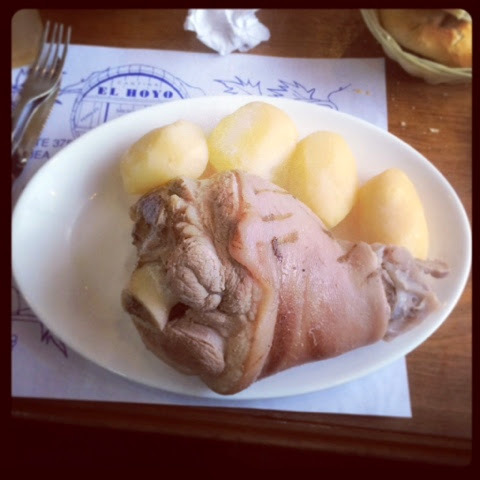 It also looked barbaric and bland on the plate with boiled potatoes but again, it blew us away. The skin trapped in all the juices of the meat and it literally fell off the bone. We were so disgusted with ourselves afterwards for cleaning our plates but this was a meal that would go down in history.